Following find a current listing of all digital media tools and acquisition devices I currently own or am borrowing; also, some brief reaffirmations regarding their daily use. One of the hallmarks of the investigation's tactics, at least early on and when living in another area of Houston, was an unrelenting drive on the part of the investigators to wrongfully incriminate me around illicit/illegal digital media or just computer usage in general. Having no tendency to store, create or otherwise traffic in such content, however ... the only way such questionable material might be associated with me would have been and would be to covertly copy it to some of my hardware or varioius media storage devices, be it hard drives or even digital cameras. There was a period, in fact, some five or more years ago, when a certain acquaintence of mine (who I knew at that time to be involved in the investigation) actually *borrowed* my digital video camera, supposedly for an out of town shoot (he was in the content creation business himself) and my hunch at that time was that the authorities wanted to utilize that opportunity to generate some sort of questionable content which would later be attributed to me. Regarding video cameras and even still digital cameras, the nature of such devices is that among their many image acquisition systems, be it lenses, print heads, etc. 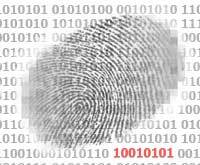 ... there is inevitably some portion of such device which leaves what could be called a digital fingerprint, if you will, on the captured media which via forensic processes can be linked absolutely back to the device that created it. This holds true with analogue devices as well as digital. Therefore, up until the recent publication of my main website (www.jbhfile.com), I've remained as far away from such devices as possible simply to cut down on the possibilities for wrongful incrimination. This has been somewhat of a bummer as my true passion as a content creator, be it video or audio or software interface, is the act of acquiring original content to work with. It might not be a smart move on my part or perhaps not one of my more sane, but since the launch of jbhfile.com and the associated blog that runs parallel in content with it, I have taken it upon myself to not only rejoin the world of computer/internet users, I have also felt confidant enough to begin occasionally producing original works using standard digital content creation tools. 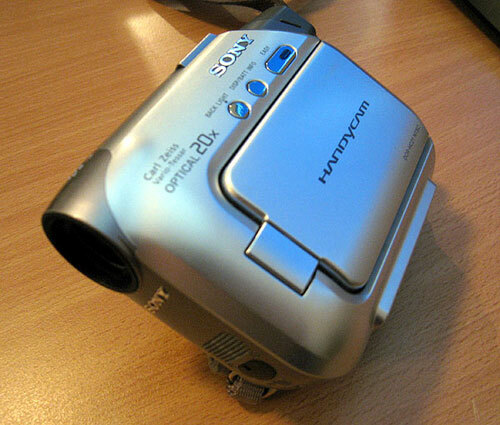 The point of this article is to not only publicly list all such devices as cameras and the like, but to also list any associated computer equipment necessary to realize my semi regular digital media projects. I will also be linking to some online examples of the type of work I enjoy and take part in when using the listed equipment. 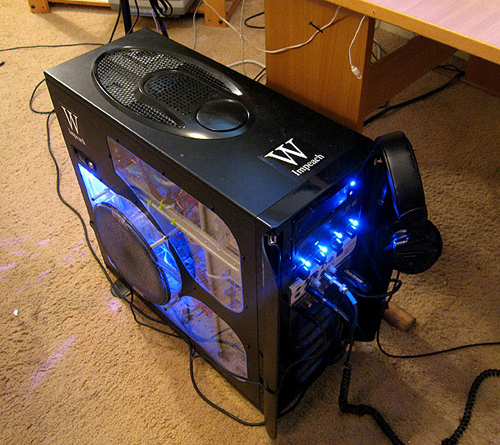 My main computer is a custom built system using an Intel Q6600 processor. 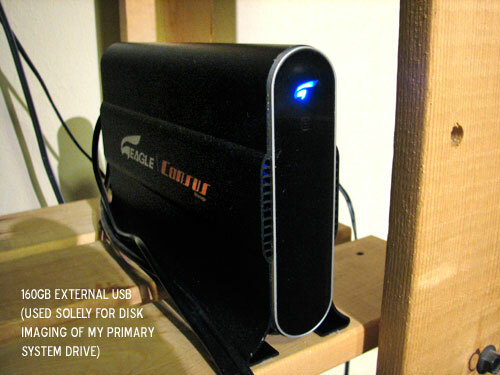 External Drives: Seagate 200gig IDE in USB housing, Western Digital 750gig drive in eSATA enclosure. Regarding the internal drives, their use should be apparent enough from the above listing. For those of you who do not know what the term 'scratch disc' means, it is simply a disc that programs or other software processes can use as temporary space. The 500 gig media drive is where I store the approximately 50 hours of digital video I hav shot over the past 10 years ... bands, street festivals, surf trips, my dog chewing on a rag, family events and other sorts of domestic and relatively benign content can be found there. 500gig USB Drive: This drive is used solely for backing up my system as image files and microsoft backup files. For imaging, I use a freeware program called DriveImage XML and for occasional backups, I use the Windows XP internal backup. IMAGE and BACKUP FILES are the ONLY files EVER on this drive. 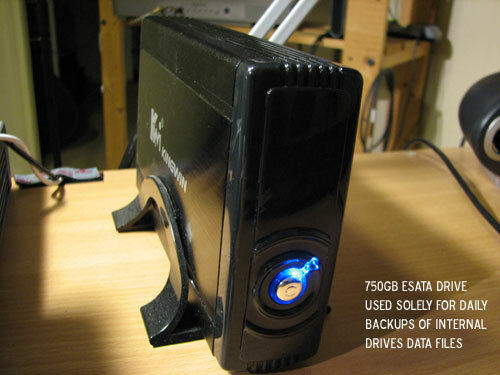 750gig eSATA Drive: This drive is used solely for daily mirroring of my internal hard drives content. The data on this disc is not 'image' files, per se ... as the above mentioned image drive is utilized for (that is, compressed and restorable images of the discs). This data is merely a way of daily backup up important data files from all of my drives.Mirrored content of my main system internal drives is the only files EVER on this drive. I state that last bit rather loudly as these external drives are a huge vulnerability should some clandestine operation against my person ever desire to plant illicit materials; these are easily accessible, external drives, meaning of course, that anyone could simply enter the house and plug in with a laptop and transfer content in a matter of seconds and then leave. I've taken cursory security measures for each of the drives and their respective file systems but such measures are quite simply thwarted if one has the right skills. The idea of these drives being criminally compromised by others is a fictional scenario, of course, but one I thought should be covered adequately here. 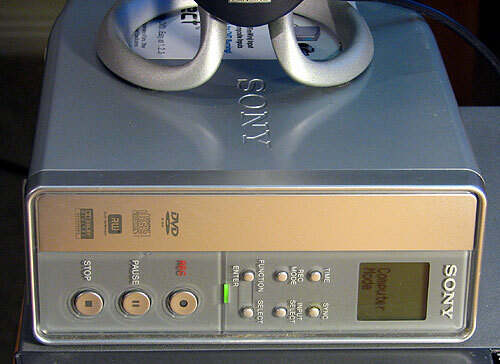 I also own two DVD-R drives which I use to not only make audio CDs, but as well to occasionally author DVD content after finishing any given personal video project. 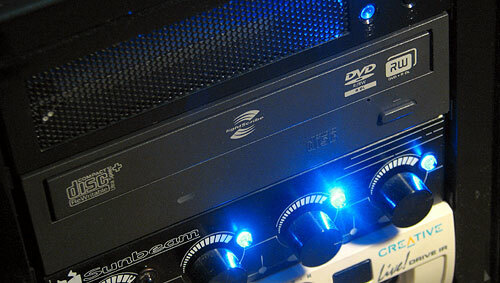 Here's a quick listing, including images, of the two DVD-R drives I use on a daily basis. The external drive is actually a drive borrowed from a family member which I use as a backup CD/DVD drive on the chance my main internal drive fails. 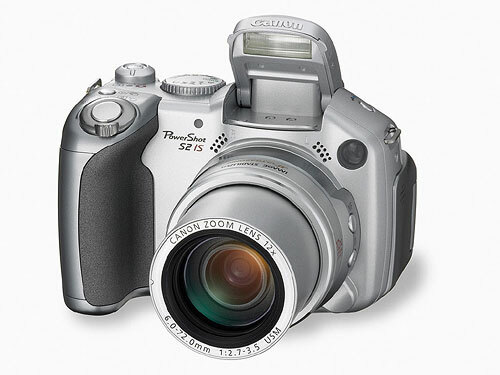 I currently am using two borrowed digital cameras; these are on loan from a family member and my aim is to be using them for the foresseable future or at least till said family member needs them back. These two pieces of equipment, like the external hard drive discussed above, also represent somewhat of a vulnerability when considering how easily accessible they are. At the end of this article, I will post links to some of those works I have already completed while using these cameras so as to give you a better feel for the types of projects I am involved in. 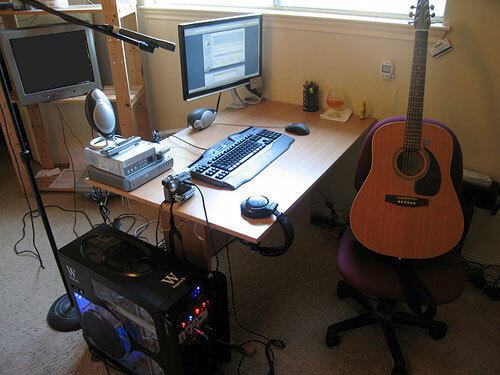 And in general, my complete computer system as a whole is rather important as that system via which I am able to do anything related to content creation, be it writing and recording a song or producing short video composites for myself or friends. As stated elsewhere in jbhfile.com, I spend a great deal of time on the computer, either writing, creating original content or maintaining my various websites. Again, as stated, computers and my skills in the usage of such represent my foremost marketable set of skillsets and considering that the investigation which jbhfile.com makes public aims to pointedly remove my rights to use such systems ... articles such as this are important to occasionally author. Notice the lack of pornographic content? And NO, it is not stored on any of the various digital media devices I might own and that are described above! That is also the same room from which every page of jbhfile.com was authored and is maintained on a weekly basis. Suffice it to say, and to reiterate what I go over in the 'Affirmations' section of jbhfile.com, the above stated and demonstrated equipment is not used to store, view, create or manipulate illicit or illegal pornographic material. Even what could only be called run of the mill pornographic content, common to most men in our society, rarely finds it's way onto my screen. Furthermore, the demonstrated equipment is used for no other illegal activity such as pirating software or copying/distributing of such nor any illegal activity of any kind. That said, here's an example of recent work completed using the tools shown above. 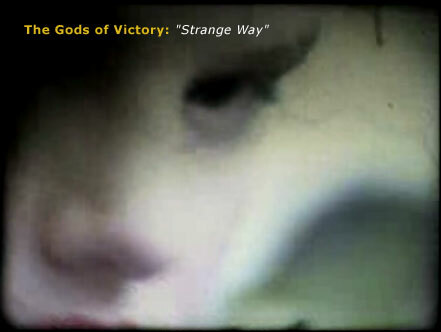 For this music video, I did all video shooting, songwriting, audio and video editing. This is a good example of the types of content creation and manipulation I involve myself in on a regular basis and for which necessary digital tools are absolutely essential. The above mentioned still shot camera is used primarily for online hardware reviews, something I've become quite enamored with over the past year or so.